Unveiling the dedication plaque for the official opening of the $4.1-million Hangar fitness centre on UBC’s Okanagan campus Tuesday are UBC President Stephen Toope, Heat women’s volleyball co-captain Chandler Proch, Heat men’s basketball co-captain Yassine Ghomari, Kelowna Flightcraft founder Barry Lapointe, and Deputy Vice-Chancellor and Principal Deborah Buszard. 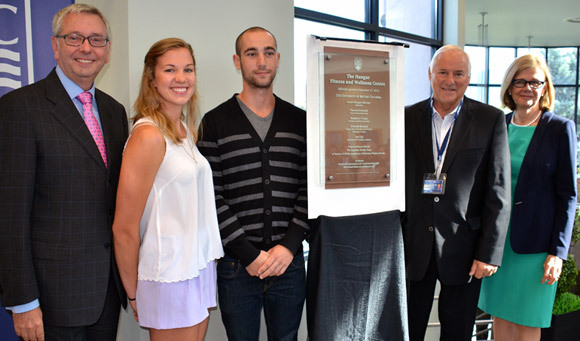 The Lapointe family donated $3.5 million to build the new fitness centre. The newest facility for students, faculty, and staff has taken flight at UBC’s Okanagan campus. The $4.1-million Hangar Fitness & Wellness Centre represents many things to many people. Not only is it an architectural work of art, but the facility -- officially opened on September 17 -- represents a significant gift to UBC while showcasing the wonders of building with wood. In operation since mid-July, the 850-square-metre addition to the university’s gymnasium houses a spacious cardio-exercise and strength-training space, studios for yoga, combat sports, spin bikes, Pilates and dancing, and will eventually accommodate an interior climbing wall. 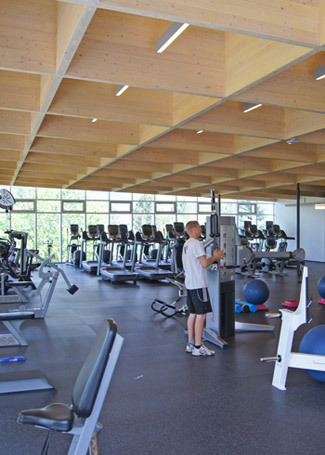 The ceiling of the cardio and weight room, about 5,000 square feet of workout space, sports the cross-laminated timber beams that give the facility a light and airy feeling. The facility’s name recognizes a generous $3.5-million gift from the Lapointe family, honouring the employees of Kelowna Flightcraft. Funding for the Hangar came with two specific stipulations – it required an aviation theme, and construction was to be mostly from local lumber to support the region’s forestry industry. A design-build competition for the building was won by Kindred Construction in partnership with McFarland Marceau Architects. The result? A remarkable structure that appears to hover beside the current gymnasium, while at the same time emulating the curved wing of an aircraft. 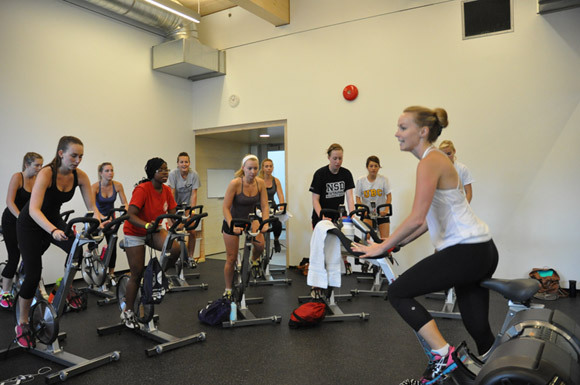 For UBC Athletics Director Rob Johnson, it also represents a much-needed space where students, faculty, and staff can exercise on the latest equipment, join a fitness class, take personalized training, and improve their health. The Hangar is also a boon to UBC’s Okanagan Heat athletes, newly minted as full members of Canada West Universities Athletic Association and Canadian Interuniversity Sport. 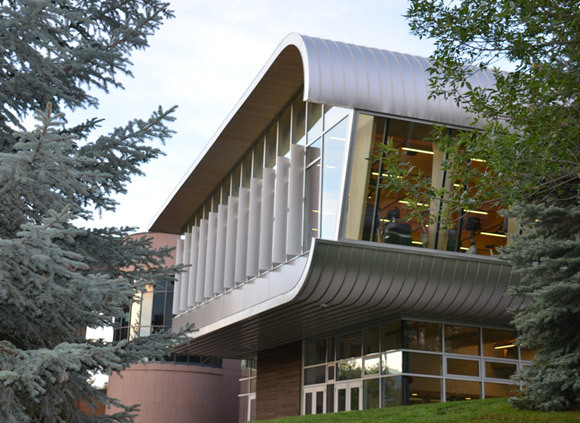 Inside, the building retains its light and airy feeling, as connection to the gym’s second floor is via a floating glass hallway – giving users expansive views of the campus. During the summer, when much of the new exercise equipment arrived, Johnson and his staff were busy looking for the right type of people to work in the Hangar. The Athletics department now boasts a full-time fitness coordinator, and 10 staff who work in group fitness and personal training areas – eight of whom are current students or alumni. An operations staff of 38 that works in customer service and as Hangar monitors, are all current students. “We have hired highly qualified, enthusiastic, and motivated people and we are partnering with the university’s School of Health and Exercise Sciences to provide expertise and student practicum experiences,” says Johnson. “As a result we can now offer group and individual fitness programming to all members of the campus community. An official opening for the new facility takes place Tuesday, September 17, 9:30 a.m. at the Hangar Fitness & Wellness Centre, beside the Gymnasium at 3211 Athletics Court, Kelowna, BC. Graduate student Ayla Graham leads a spin class in the Hangar’s downstairs studio, proving to be a popular fitness outlet with students.